Don’t formula makers realize that dads feed babies, too? No matter how often we view it, it’s always a surprise to see formula makers ignore dads as equal parents. Dads can’t physically breastfeed, but they certainly can formula feed. And they buy formula. A lot of it. As such, one would think dads should be huge targets for laser-focused marketing that capitalizes on the influence of fathers and formula feeding. Dads could be the primary ambassadors for a product that formula makers could woo in order to assist them in promoting healthy formula feeding. Nope. Almost every formula manufacturer still disregards dads as parents who feed babies. Take a look at the site revamp of Enfamil, where you’ll find a bit of irony on its Better Together page. First, it exclaims: “The world outside is full of things that divide us.” Yep, things like websites — and marketing campaigns, hashtags, imagery and menu tabs. In fact, there isn’t much to find that’s inviting on its site for fathers looking for content about the products they’re using to feed their children. Second, it indicates that “…we are raising the next generation of extraordinary men and women.” Also true. But these eventual extraordinary men will be disregarded upon becoming dads by the very company that celebrates them. Third, it speaks of “uniting” throughout its website. Um, right. Most of it looks like a divide. Dads are creating, expecting, growing, feeding and nurturing babies every bit as moms, but you wouldn’t know that by looking at the Enfamil site. Perhaps Enfamil could invite some of its paying customers to talk about their experiences as parents. Enfamil won’t have to look far. Those customers are the same ones who get up in the night and take on feedings whenever needed. They’re the ones who read nutrition labels and care about exactly what they’re feeding their children. They’re the ones who want support and want to share it. They’re the ones who work at a job that helps to pay for the formula. A hook that’s only for moms? There have been plenty of pointlessly gendered products before, but a hook? The Mommy Hook is a useful tool that clips easily onto a stroller and allows you to get your bags anywhere without needing extra hands. It’s simple, inexpensive and clever enough that you might just want to get your hands on one. Alas, it isn’t hard to get another brand. The Mommy Hook is a fantastic product, but it’s essentially a carabiner – something you can buy just about anywhere. The exclusionary name is particularly surprising when you discover that it was created by a dad. We contacted the company to learn more, but were met with no response. Let’s hope The Mommy Hook can consider a name change before both moms and dads start to give it the hook. Company evolution and innovation is the hallmark of any successful operation, but such progress is muffled when weighed down by a tagline that harkens to a bygone era. While companies create slogans to market their products, many remain convinced that dads haven’t changed, and so the simple solution is to keep the communication the same. Therein lies the problem: society has changed and today’s dad is an involved consumer like never before. More importantly, he’s an active parent. With that brings a vocational conviction that stretches beyond serving merely as a breadwinner and secondary parent. Dad is an equal family player and meaningful parent in every way, shape, form and instinct – every bit as mom. As a result, the consequences of ignoring dad as an equal and competent parent are catching up to the corporate world. While competitors offer new brands that speak to evolving and discriminating purchasers, companies are realizing that they cannot rest on the laurels of past success and generations of loyal customers. Customers are changing, both in terms of age and demographics. It’s clearly a different ballgame now, and a failure to keep up with today’s modern parenting realm means a loss of precious revenue and market share. There are also unintended negative effects on the matron targets of current corporate campaigns. The harm here is that it places unwanted pressure on mom, who of course is now increasingly found in the workforce. No, she doesn’t want to have to place her stamp of approval on everything. She doesn’t want to be the sole decision-maker, nor does she want to be forced into the habit of thinking that becoming a better mom involves choosing the proper peanut butter. While the 1950s mom ran the household almost entirely alone as dad provided the monetary support, the world is different now. Today, mom has a balanced counterpart in the parental world. Neither is in the lead or usurps the other. This person, of course, is dad. Another consequence of ignoring dad in marketing is not only the degradation of fatherhood, but also motherhood and parenthood. Continuing to portray dads as incompetent shoppers, substitute parents for moms, or part-time sidekicks is an insult to moms. It questions the mom’s choice she made to become a professional woman. It’s she who desires to focus on providing the best for her family and reach her utmost career potential instead of staying at home with the kids. It also belittles her decision to marry the man she chose to be her husband and father of their children. No matter how you add it up, the commutative law of addition still yields the same result. Motherhood + fatherhood or fatherhood + motherhood – both equal parenthood. The good news is company and marketing executives have the power to change how they view dads as parents, as well as consumers of products and services. 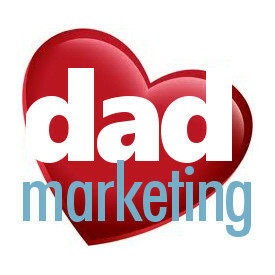 Even better news is that dads continue to be an evolving and growing target market. Everyone keeps telling us the days of traditional gender roles are long gone. They say men care for and nurture children, just as women work outside the home. Both parents contribute no matter what task needs done, because the lines are blurred and times are different now. Ask around your circle of family and friends, and chances are those perceived dynamics match the real world. Moms and dads do indeed share responsibilities, but that’s not how the corporate world sees it. There, particularly in the realm of marketing and media, you’ll find a different story where stereotypes are held onto, where there’s a belief that only mom runs the show. That’s never been more evident than with the Chick-fil-A Moms Panel, a corporate initiative which works to bring moms news and announcements, gather feedback on future programs, and provide exclusive opportunities and gifts. The program is driven through BSM Media, a marketing and media company that specifically focuses on connecting brands with moms. The Chick-fil-A Moms Panel is believed to have close to 1,000 moms on this year’s panel. That’s a lot of moms who can help Chick-fil-A learn more about their offerings and the way they address customer service. The only problem? It’s forgetting half of the parenting equation. Last year’s industry-first book, “DADLY Dollar$,” revealed several interesting facts about dads. A 2015 qualitative study by consumer insights firm iModerate indicated that dads make impromptu purchases first based on price. But there are other reasons. One reason is that they want to reward their children for good behavior, accomplishments, or even to avoid an in-store meltdown. In addition, they also like to give their families treats, either to celebrate events, reduce home tension, or indulge loved ones. They also do so out of convenience, for the sake of planning, and to anticipate items they might need. If money issues are often at the root of couples’ arguments, it may not prove who is right or wrong, but it at least proves this: dads have a hand on how money is spent. Operating a moms-only panel isn’t only about ignoring half of its customers, it’s about losing out on potential revenue and the opportunity to learn how today’s modern families spend money. Rather than focusing on missed opportunities, we see Chick-fil-A as having a new opportunity to be a part of dads’ lives. In fact, there’s no better way for this family-owned business to remind everyone that families also include dads. He argued that only a small percentage of dads care, so small that it doesn’t justify considering dads as an ignored group. It was a bit surprising to hear these remarks from a father, so let’s take a moment to address this today. There is power in marketing that can completely change society as well as societal views. If it were perceived through marketing that, an active and involved dad is “the norm,” it would make sense that a dad’s desire to be a more active and involved parent and shopper would increase. Since the 1990s, fatherhood has evolved, and today an active and involved dad is, indeed, the norm. This evolution of fatherhood is a direct result of the changing workforce as more and more moms have taken up work outside of the home, more and more dads are cutting their hours or staying home part- or full-time with the kids; thus, moms are becoming primary breadwinners, too. This parental unit demographic desperately wants, and needs, to feel accepted for their decisions. As such, if dads are comfortable in the shopping and buying experience, they will do more of it voluntarily. In today’s modern family, dad is now also in charge of buying groceries, clothes, school supplies, and other products and services the family needs to exist. A dad also needs to see he is a trustworthy purchasing agent for his family. The best way to do this is to involve him in the marketing process and value him as an equal parent as well as a valued customer. By marketing directly to moms as in, the “mom-tested” mindset, it reinforces an archaic stereotype and subliminally makes a dad feel that the mom is a better/leading parent. It also makes the mom feel as though she shouldn’t have re-entered the workforce, and by her doing so she is less of a mother. This is insulting to moms and dads, but yet it continues. Change is hard, especially if it’s an idea or venture one has never explored before, like marketing to dads. Changing the way we view, treat, and market to dads is necessary because there is a lot at stake. Dads represent half the parenting population. That equates to a significant loss of revenue and profit for companies and businesses not catering to the dad demographic. Also at risk is the image of dads as parents for this and future generation of boys and girls who will eventually become parents and consumers. Our mission here is encourage all of us to change the way we think about, view, and treat dads. It is our hope that we’ll help companies and businesses capitalize on the benefits of marketing products and services to today’s active, involved dads. The case to include dads in advertising goes far beyond monetary gain. Society stands to benefit from a world that acknowledges dads as equal, competent parents. In fact, children, marriages, and the entire parenting community will all reap the rewards of dad inclusion. Just like the Mr. Mom label, all of this is a big deal when you look at the larger picture. No person should be subject to a label that implies incompetency or reduces his or her value as a person or part of the family. We’ve never heard workforce moms referred to as “Mrs. Dad.” If someone did, we’d also find that degrading to motherhood. One of our recurring messages is that words matter! Simply put, we’re merely asking others to think outside the juice box. Yogurt is no more a feminine product than a bowl of oatmeal is masculine, but try telling that to your mouth – or your mind. Product positioning has long labeled yogurt as diet food, which attracts a certain kind of customer. And that customer is typically female – one who tends to be concerned with how she looks to others. Genderizing a product is really nothing new. The Marlboro Man sold cigarettes to men for decades. Hungry Man dinners and Chunky Soup appeal to men, as well. There are also plenty of other pointlessly gendered products that are sure to draw a chuckle. Much of it is nonsense. Of course, there’s nothing feminine about milk, cream, fruit and sugar blended into one. Executives are merely trying to target their strongest demographic by positioning products around selling points that appeal to women. So we know how they do it, and we know why they do it, but a larger question remains: why turn away revenue by ignoring those remaining customers? The NFL remains one of the most successful American ventures around. It enjoys a varied mix of massive fan interest via huge TV ratings, millions of tickets sold, team apparel, fantasy leagues and its own TV network. The list could go on and on. Let’s also not forget that little game played at the end of the season which has become a cultural phenomenon like no other – the Super Bowl. This event has become far more than just a football game. Super Bowl commercials are a spectacle to behold, achieving status as the most valuable piece of TV marketing real estate in the world. Yet despite the large focus on advertising, there’s no doubting that football is predominantly a man’s game. There has not been a single female player in the history of the NFL, and this male-dominated business appeals heavily to the masculine side of human nature. But does that mean females can’t enjoy the game? Does that mean that women can’t be involved in the industry elsewhere? Does that mean women and football don’t belong together? Of course not. Rather than focus 100 percent of its effort on targeting males even further, the NFL has invested millions in marketing campaigns aimed at women. Female viewership of the NFL grew by 26 percent from 2009 to 2013, according to Athletic Business, which also said that 53 million women in the U.S. watched the 2015 Super Bowl, almost half the total audience of 114 million. Couldn’t Yoplait do the same with men and dads in their world? Instead, it touts a #MomOn campaign that squarely ignores the contribution of fathers to raising and nurturing children. Today’s customers demand inclusion, equality and far less stereotyping. Dads are being left out in a really unfortunate way, and promotions like #MomOn aren’t doing anyone favors, because it also unnecessarily heaps all the responsibility on women. It’s going to take a little more work than having Cam Newton serve as a spokesperson or slapping “Official Yogurt of the NFL” on cups. And we certainly don’t need more genderized gimmicks like Brogurt. Remember what happened to Lady Doritos? Yogurt need to be reimagined, because today’s modern family has changed and parenting is shared. The first yogurt who can figure this out stands to reap tremendously in a confused and oversaturated yogurt industry.